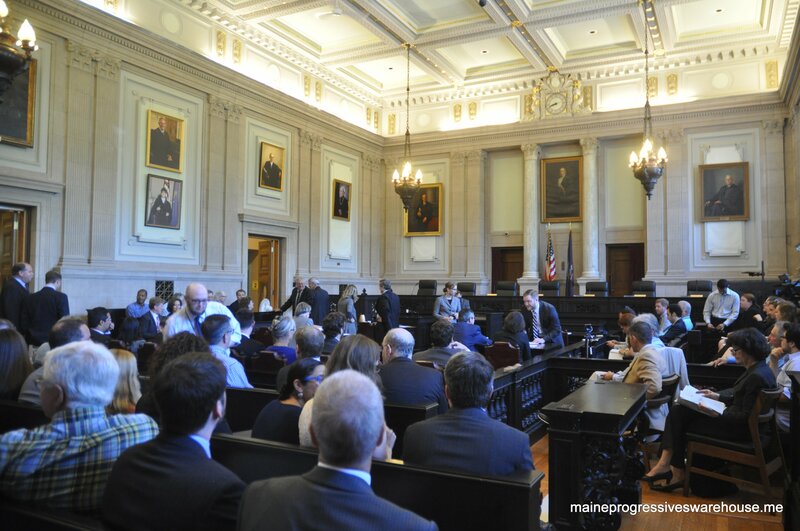 “The Maine Legislature must deal with a number of challenges as legislators return to Augusta this week. Maine is in the midst of the worst drug crisis in state history. Governor LePage requested funding for 10 new MDEA agents immediately to help fight the supply side of this epidemic. That funding has been found within existing resources and the process of recruiting those agents has already begun. Now it’s time for legislators to turn their attention toward drug treatment and education. This is an issue that requires a thoughtful and thorough process and whatever plan is ultimately brought forward for a vote must be completely vetted by the committees of jurisdiction. We cannot afford to race through this process. In addition to the drug epidemic, there are several fiscal issues that demand the immediate attention of legislators. •	Tax Conformity: On the heels of the omnibus spending package passed in Washington last month, whether or not Maine complies with these new tax changes could cost roughly $40 million. •	Voter approved changes made to the Maine Clean Elections Program will cost the state an additional $7-$10 million. 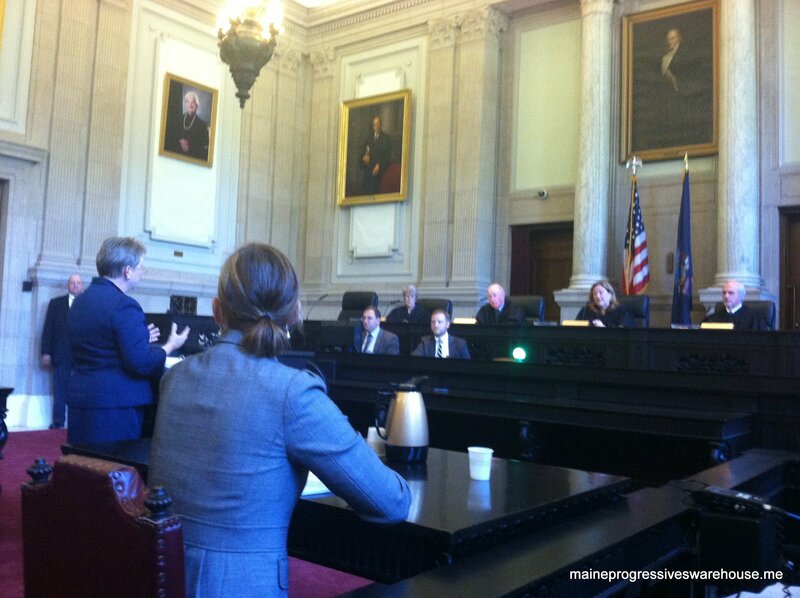 •	Indigent Legal Services: This program was not funded for the second year of the biennium. This is a constitutionally mandated program and will require $4 million in funding. •	County Jails Issue: A bill to address the situation with the county jails was carried over to the upcoming session. This also has the potential to cost the state additional money. Since then, a poll conducted informally on one of the Bangor Daily News blogs has recorded that of almost 5400 Mainers responding, 89% want to see the governor resign. 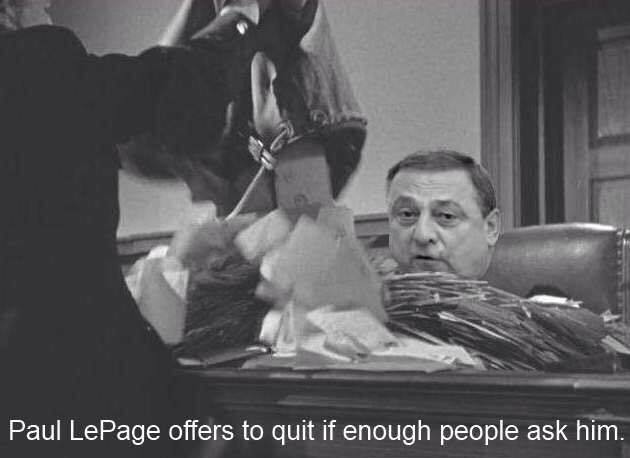 Although LePage during the radio show stated that he had only had four requests for his resignation, a quick scan online finds many more than that are reported to have been sent to his office. 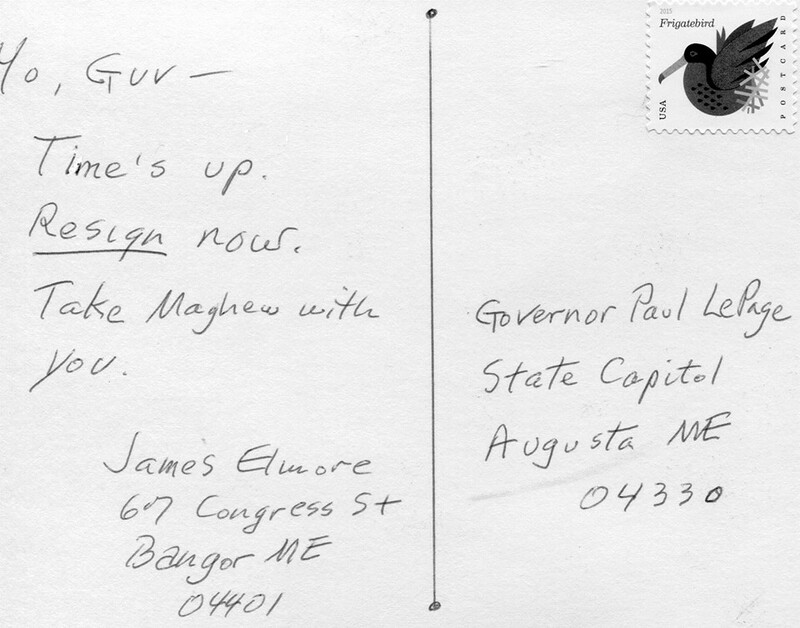 Here are a few of the confirmed letters and emails to Maine’s chief executive. Dear Governor LePage: When you first ran for Governor of Maine, I have no doubt you intended to do your best for our state. Today, doing your best means turning the reins over to someone better suited to the job. I hope you’ll consider this an earnest request for you to do the right thing and resign. 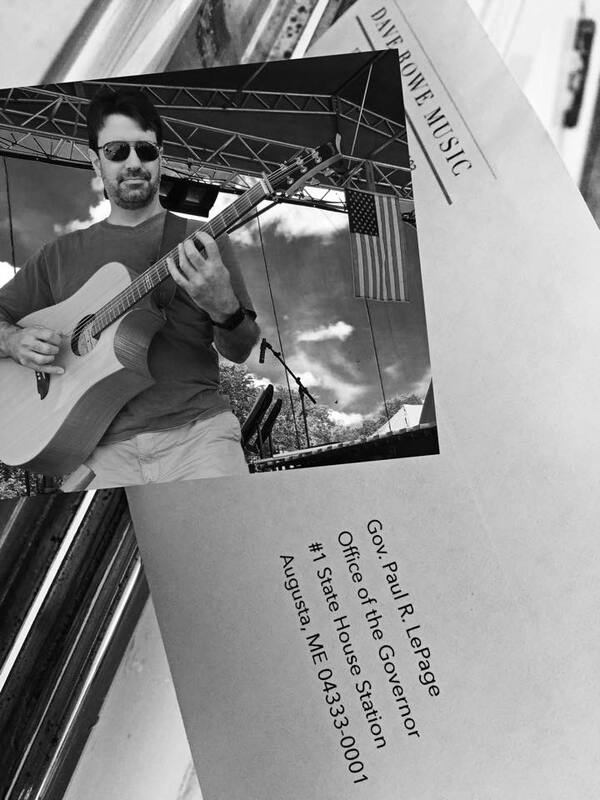 “Dear Ms. Mullen: I would appreciate it if you would ensure the Governor sees my urgent request. Thank you for your e-mail to the Governor. Our office appreciates hearing from you and will take your suggestion (s) under advisement. Thank you again for taking the time to write. Have a nice Day. Thank you for taking the time to contact me. This message is to confirm that my office has received your email and will be taking appropriate steps for follow-up. Your ideas and suggestions are important to me. Depending on the nature of your issue, your message may be assigned to one of my designees for direct follow-up with you. My staff and I are committed to providing you with a timely response to your issues and concerns. If your email is regarding a scheduling request, please make sure your message includes information about the time and location of the event and a brief summary of the agenda. Please resend your email with that information, if necessary. Again, thank you for taking the time to share your thoughts. You said you would resign if enough people asked you to do so. Please keep your word. You have hurt people who needed help and never listened to anyone who tried to explain how what you were doing was harmful. You have disregarded and disparaged anyone who did not bow to your commands. You have treated the people of Maine with utter disrespect. You have behaved like a school yard bully with other elected officials and used name-calling as a tool to puff up your ego while never giving clear answers when questioned about your actions. It’s time to get Maine back to the place people love and stop driving away anyone who is not up to your estimable standards. No one elected you to become a petty dictator. You were elected to govern Maine according to the Constitution and the law, not according to your very flawed ideals. It’s time for us to go back to work making Maine a great state and erase the embarrassing stains you have put on our reputation. It pains me to write this, even though I’ve never been a supporter of yours. I dislike partisanship enough that I’ve never registered to a political party since I started voting as a teen, but I dislike the disarray you’ve brought to Augusta enough to write this brief note. Please step down as governor. You’ve embarrassed yourself and our fine state enough. You began with the best of intentions. I know that. You seem like an honest man, and I trust my instinct in this regard, but good intentions cannot be confused with leadership, and you seem to have been confusing them for 5 years now. Now, with dwindling support among members of your own party, you cannot possibly be expected to lead or to accomplish the lofty goals you set for yourself upon taking the oath of office. Please step down. I have no doubt that Mike Thibodeau would do a fine job picking up the disarray. I implore you, for the good of the state we both love. It’s time for Augusta to get back to work, and that just can’t happen with you at the helm. It is time for you to go. You are not qualified in intellect or temperament to be our Governor. I hope you leave soon. I’m hoping you meant what you said regarding your resignation as Governor of Maine. You and your tea party friends have taken Maine to a new low. Your policy actions and bullying have become a joke with the National media, and a huge frustration for Maine taxpayers. I could go on for hours regarding the problems you have created for Maine citizens and taxpayers, but I’m sure you have heard it already. My hunch is this resignation statement you made is rooted in the legal advice your attorneys are providing. I believe articles of impeachment will be charged against you. I am not an attorney, or a member of the Maine Legislature, so I don’t honestly know if the votes are there to impeach you. However, I have observed that with each passing day more R’s in the Legislature are distancing themselves from the messes you have created. So, as a Maine taxpayer, I will sit back, make some popcorn and watch all this play out. 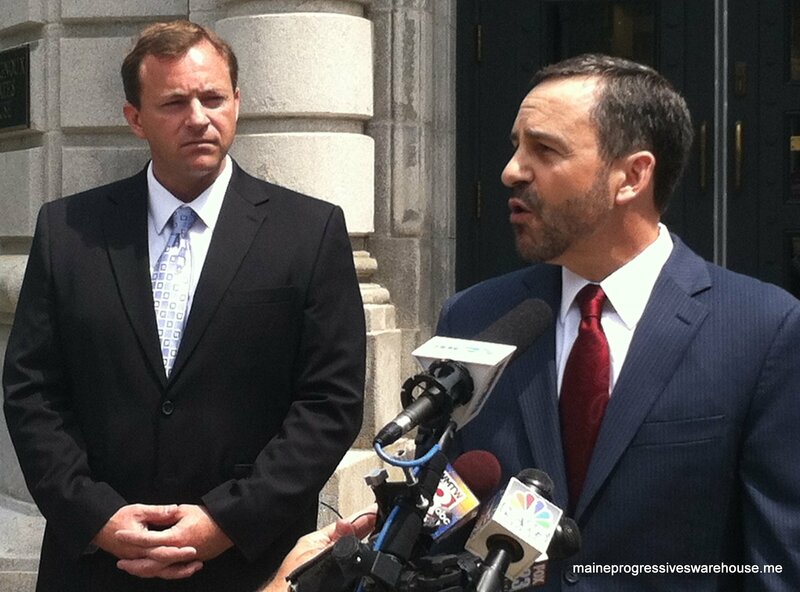 Paul, do the decent thing that Maine taxpayers deserve and resign. Please know there are more than four of us Maine citizens that would like you to leave office. I would like to add my voice to the hopefully growing chorus of those utterly tired of your buffoonery, misuse of power and obstructionism. You are a disgrace to this state and have no place holding a higher office. Methinks the entire concept of politics as compromise and mutual effort escapes you. Return to the private sector to be the dictator you so long to be, please, and allow someone worthy to occupy the office of Governor. I will refrain from the vulgarity that you, frankly, deserve. Please go. Now. Thank you for your time, but sadly not your service. I would VERY much like to take you up on your offer to resign if the people of Maine raise their voices against you. Since you asked, YES, please resign, soon. You probably don’t get much honest feedback, but there are many reasons why you are not a good fit for the position. If you would like to discuss those reasons at length we can do that. A resignation is in everybody’s best interests. I don’t begrudge you the pension; it is a cost of doing business. Enjoy the rest of your life! As much as I would love to use expletives in the fashion that you do. I will remain polite and somewhat to the point. The people of our state have endured your lousy leadership for far too long. It is with as much respect as I can muster when addressing you that I very politely ask you to resign. Please, step down from the office of Governor of the great state of Maine. I am from Lewiston. I am of French Canadian heritage. I speak French and went to parochial school for eight long years. I am not from away. I have always lived in Maine and hope to live my life out here (I am sixty now). Many good, sane people are against your tea party-like leadership. We are embarrassed to have you in office. We never voted for you and know that the only way you got elected was because of Elliot Cutler’s run. Please step down, Governor. That’s what we want. Please resign as Governor of Maine. The people of Maine find you highly offensive and a complete embarrassment. Thanks in advance for stepping down as Governor. We are tired of your ineptitude and careless irresponsibility to actually represent the people of Maine. Please resign. You are an embarrassment to the people of Maine and are causing serious damage to our state. Please just leave now. I personally believe that Governor LePage should quit. He’s been nothing more than an impish childish bully. When I hear one of his tirades I picture a spoiled brat standing in a sandbox stomping his feet hoarding all the toys and not letting anyone else play because he’s not getting his own way. His actions have not saved taxpayers money but have cost us. He forgets that he represents all of the people of the State of Maine; not just the super wealthy and those who chose to play his games. Governor LePage is vulgar and has stained the reputation of Maine as being level headed. Though he could have been a great governor and did the hard work with couth and willingness to work across the aisle. He chose instead to act like an irrational buffoon who speaks before he thinks. If he truly cares about what is in the best interest for the State of Maine he will resign. I have a great deal of respect for the office of governor ; and the man in it has not earned my respect because of his blatant disrespect for others and blatant disregard for the laws that govern this state. Please Governor LePage resign so that we don’t have to impeach you. Please resign for the sake of the State of Maine. I am asking you, requesting that you exit your office in the quickest and most assured way that never will you return. The people of Maine need a mature, grounded and non partisan Governor if we are to survive this difficult times, let alone progress to a better position financially, educationally and morally. Your actions have been childish, play ground type antics that not only embarrass our great state of Maine, but also interfere with the welfare of the people who love it and choose to live here. I wish you good luck in your endeavors outside of political office. Perhaps one that does not include personal contact or decisions concerning the lives and future of other human beings. Maine’s three political parties, the Democrats, Green Independents and Republicans, will now caucus to choose candidates for the seat. Candidates must be nominated by 5 p.m. on Friday, Aug. 28. Petitions for non-party candidates may be requested from the Elections Division and must also be submitted to the Secretary of State by Friday, Aug. 28 at 5 p.m. Write-in candidates must be declared and file with the Secretary of State by 5 p.m. on Sept. 14. The candidate elected by Sanford voters in November will serve out the remainder of Noon’s term, which will run until the General Election in November 2016. Noon is an organic sheep farmer. She raises sheep on her 75 acre farm in Springvale. 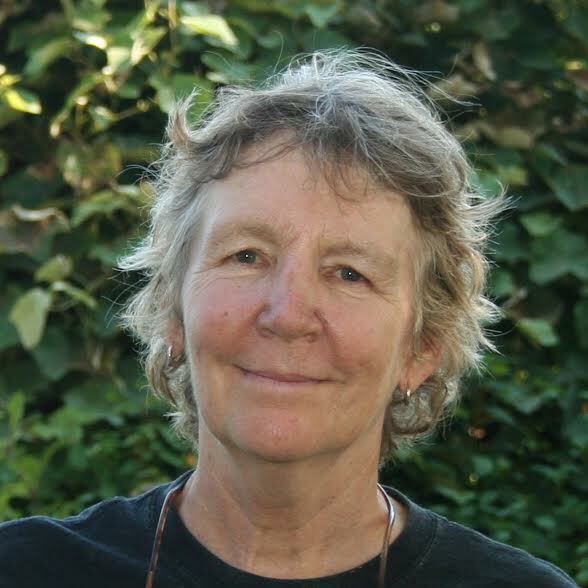 Jean also served as an art teacher for 13 years in local public schools.